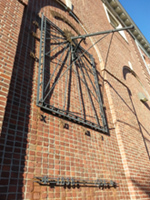 The vertical dial is a metal frame approximately 4 x 5 feet set high on a brick wall. Within the frame are metal hour lines from 6am to 5pm marked by Roman numerals. The hour lines are adjusted for the dial's longitude to show time for the 75th meridian. Metal lines for the solstices and equinox are set for the shadow of a small spherical nodus on the gnomon rod. The gnomon itself is anchored to a bronze plate stylized as the Sun. The 3 x 4 foot vertical dial is set high in the ashlar sandstone wall of Wilson Hall, the original Physics Building. In the middle of the dial is the Brown University shield, holding the gnomon rod. Surrounding the shield are hour lines. In the original 1890 architect's drawing, the hour marks were Arabic numbers from 6am to 6pm, but as built, the numbers were engraved Roman numerals and set inside the hour lines. Half hour marks were added as well. No longitude offset is made such that the noon hour line is vertical. This is a traditional vertical dial approximately 4 x 6 feet. 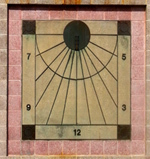 The dial is surrounded by a row of square pink concrete brick. The dial backdrop itself is concrete with decorative dark block squares in each corner. The dial consists of a simple metal frame with hour lines that radiate from a small top central circle, all well proportioned. Hours of 7, 9, 12, 3, and 5 are marked with Arabic numbers, keeping the dial face simple. No solstice or equinox lines, but there is an artistic circular arc surrounding the central circle. Unfortunately the rod gnomon is completely missing. This 18th century dial is made by Benjamin Martin an instrument maker in London. 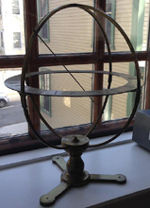 It is bronze, approximately 18 inches in diameter. The gnomon rod is held by an meridian circle attached to a heavy bronze pedestal with three legs. The horizontal time ring, held by the meridian ring and an east-west ring as well, is engraved with Roman numerals.